Back in the day……..oil water separators were basically concrete vaults or steel tanks that were sized based on their total holding capacity. This holding capacity was related to the retention time needed to separate the oil from the water. Most cities and counties would size the oil water separators based solely on the square footage of area draining into the separator. This method, which rightfully erred on the side of caution, often tended to require facility owners to purchase extremely large separators. Today…….our oil water separators are engineered with multiple compartments and equipped with extremely efficient coalescing media to separate the oil from the water mixture in a much smaller system! Our media is capable of removing essentially all free and dispersed non-emulsified oils to an effluent concentration of less than 5 ppm. We now size our separators based mostly on oil viscosity and flow rate so they can be much smaller than they were in the past. 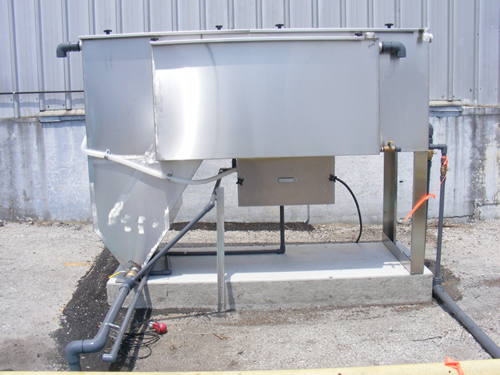 If needed, we can provide information and analysis to the regulatory agencies, which indicates that, at the calculated overflow rate, the separator will be properly sized and provided with the required square feet of projected plate separation area to achieve the specified performance under laminar flow conditions. Calculations shall take into account the rate of flow, potential surge flow, influent concentrations, particle characteristics, fluid temperature, fluid specific gravities, and PH. Featuring one of our oil water separator designs to be placed under ground.